Yes, that’s a minus sign, because the event in question hasn’t happened yet. This is my first report from the upcoming SpringOne2GX conference, which starts in Dallas, TX next Monday, 9/8/14 (or 8/9/14 for my non-US-based friends). Since there are no talks on the opening day (just an opening keynote and reception), I’m arbitrarily designating that as Day Zero. I’m giving several talks at the conference and I thought I’d comment here on my preparations. I also have a kind of “insider” status, being a member of the No Fluff, Just Stuff conference tour (one of the organizers of SpringOne2GX*) and, as the author of Making Java Groovy, I know a lot of people in the community. That will hopefully give me opportunities to share amusing anecdotes and other non-presentation-based tidbits of information here. *What is the proper hashtag for the conference? In past years people have recommended #springone2gx, but that’s way too many characters. The value #s12gx seems reasonable, but didn’t seem to catch on. Most people I know used #s2gx, which is probably what I’ll adopt. Speaking of embarrassing anecdotes, let me give you one right away. Two years ago, after one of my talks at that year’s s2gx conference, Guillaume Laforge and Cedric Champeau came up to me to say hi. Guillaume, who lives near Paris, has an outrageous French accent. Every time I talk to him I keep thinking of this character from the classic movie. So I finally got up the nerve to ask him, “Just once, would you say to me, ‘your mother was a hamster, and your father smelt of elderberries!'”. He and Cedric both just stared at me like I’d lost my mind. They had no idea what I was talking about. It wasn’t until later I realized that even if they knew Monty Python and the Holy Grail (a minimum requirement for any decent developer), they knew it in French. This is an introduction to Grails, combining domain classes (of course, Quest, Task, Knight, and Castle), controllers, services (using the Google geocoder), and more. Experienced Grails developers can comfortably skip it, but newbies will no doubt appreciate the introduction. I plan to add in some architectural discussions, as well as some Hibernate and/or Spring stuff if time allows. I gave a similar talk a couple years ago, but things have changed significantly since then. As a minimal example, now the default unit testing framework is Spock, rather than the JUnit subclasses we used to use. Everything is annotation based, too. I’ll definitely talk about testing controllers, services, and domain classes (constraints), and plan to do a couple of integration tests as well, and then talk about various plugins, like the Build Test Data plugin and some other functional ones. As I travel from company to company*, I rarely see the new REST capabilities in Grails 2.3+ being used. Last year Graeme Rocher did a wonderful presentation on them, as well as a brief discussion of the asynchronous capabilities in Grails. I hope to cover much the same (REST) ground, but rather than get into async I’m going to talk about customizing responses, using HAL for hypermedia, and so on. *My day job is teaching technical training courses in pretty much all areas related to Java, specializing in open source topics like Spring, Hibernate/JPA, Android, Groovy, and Grails. That means I visit somewhere between 30 to 50 companies a year, and while I’m mostly talking to people who don’t know much about Grails yet, I’m always trying to find out what they are using. Between that and the NFJS conferences, I get a decent sense of what is becoming popular in the industry and what isn’t catching on. As a sample, both Groovy and Grails are still growing at their normal slow, steady pace. Spring Boot is generating a lot of excitement among the more advanced developers, but most Spring users in the field haven’t even heard of it. I imagine this year’s conference will start to change that. I gave a similar talk last year, and was just getting ready when Paul King walked into the room. Paul King is one of the Greatest Groovy Experts Ever, and I experienced a flood of Imposter Syndrome as soon as he entered. Fortunately, he didn’t violently disagree with anything I said and was kind enough to share some additional information after it was over. Is it any wonder he is one of my personal heroes? 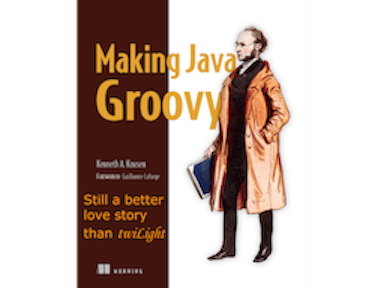 Another interesting Paul King tidbit: last time I checked, he had more commits to the Groovy code base than anyone, ever. Heck, I just checked and he did six more today. I’ve updated the talk with new information, which should be fun. The toughest problem I’ll have is not giving away spoilers for the Groovy Puzzlers talk coming later in the conference. This is a big one for me. The fact that Android applications are now built using Gradle is a big deal for every Android developer, and the Android plugin for Gradle is still evolving at a rapid rate. The new IDE, Android Studio, is also changing all the time. My hope is to give the most up-to-date information on it possible. I’ll show the multi-project build they use by default, add some dependencies, run some tests (using the Robotium plugin), talk about Spring Android, and show some flavors and variants. Best of all, I expect to try to update Android Studio right before the talk, so I have the latest possible version in the so-called Canary channel. What could possibly go wrong? This is a revised and extended version of the same talk I gave at the Gr8 conf in Minneapolis in July. Those talks were limited to an hour, and given that lots of speakers were talking about Ratpack*, I decided to focus on Grails for the REST part. Now I should have time for both. *Dan “Tiger” Woods is giving his Ratpack Web Framework talk at 2:30pm on Tuesday. Let me know if you have some better suggestions. Also, Lari Hotari is giving a talk on Ratpack and Grails 3. Since there are no images in this post, here’s a small spoiler from the Groovy Vampires talk. Note the nice subtitle. If you’re coming to the conference, please drop by and say hi. I hope to write a short blog post every day of the conference, commenting on what talks I attended and which people I spoke to, but that’ll depend on how much last minute “updating” I’ll need to do on my slides.